The Ontario election campaign has begun in earnest. I've got a few observations I'd like to share and some predictions. Remember the 2014 campaign when almost every pollster was predicting Kathleen Wynne's Liberals would be turfed out? By the end of that campaign, most predicted she'd, at best, win just another minority government. I, as some will remember, had predicted a Liberal majority that year and I was right. Of course, the public wasn't so easily confused. The next day, the Liberals swept 20 out of 22 Toronto ridings and took 39% of the provincial vote, versus 31% for the PCs and only 24% for the NDP. Utter shock was expressed by most pundits and pollsters at the result as almost no one had predicted a Liberal majority. The only pollster that accurately predicted those vote percentage results was Nanos Research. His last poll, released almost three weeks before election day, gave the Libs 38%, the PCs 31% and the NDP 24%. 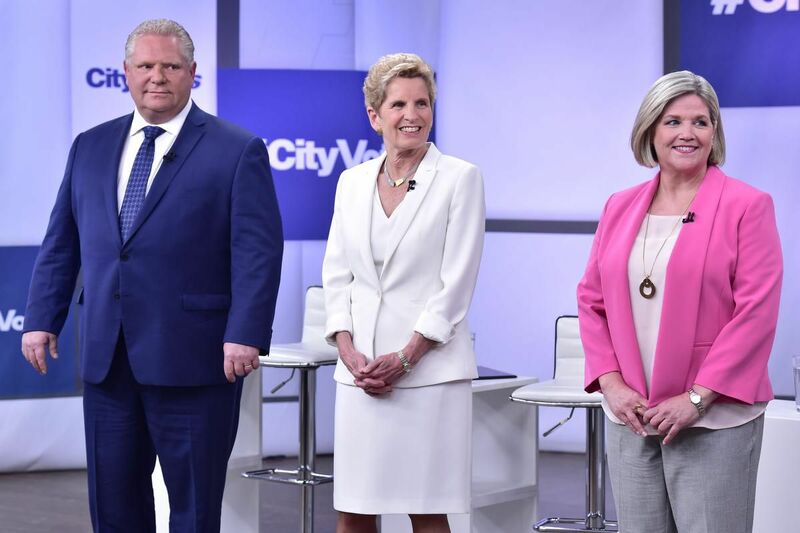 In addition, most other polls had shown a roller coaster race with parties going up and down, including an alleged bump in the polls for Tim Hudak after the leaders' debate. But for me, it was telling that Nanos' last numbers published before the debate didn't really move at all on election day. Since then, I now only truly trust Nanos and disregard most of the rest. Thus poll aggregators or averages must be also regarded with suspicion. 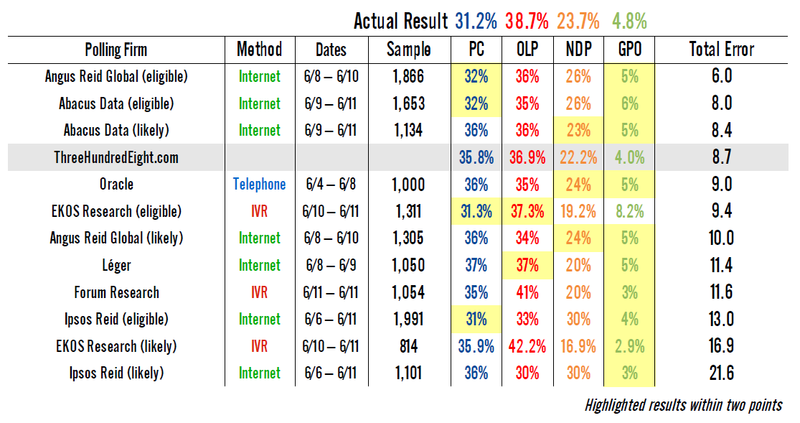 Today, while most pollsters are pushing the idea that the NDP is in second place, Nanos instead puts the Liberals firmly in second with 31%, with the PCs at 42% and the NDP at 21%. The media of course want to sell papers and get you watching their newscasts. Political reporters and editors are obsessed with the alleged "horse race", focusing more coverage on the latest bogus Forum Research or Ipsos poll rather than more intelligent coverage of ordinary voters and the policies at stake in this election. Lately, especially amongst the private sector media, I'm seeing a few dominant themes: Ontarians overwhelmingly want "change" in this election; Doug Ford's PCs are far ahead in this race; Kathleen Wynne is dead woman walking (a City political reporter actually called her that after Monday's leaders' debate); and Andrea Horwath's NDP is showing huge growth potential and looks poised to win over progressive voters, thus relegating the Ontario Liberals to third place. For three years now, it has seemed to me that most media and pollsters (namely Forum Research and Mainstreet, the only two pollsters to frequently release polls between Ontario elections) have constantly pushed the notion that Wynne was overwhelmingly unpopular and headed for certain defeat. Even if most reporters didn't fully believe it, their fondness for "political drama" has gotten the better of them. The vicious hatred directed toward Kathleen Wynne these last few years has baffled me. There has never been an elected leader whose agenda has been so relatively popular, yet faced bad polls like this. According to Forum Research, Wynne is less popular after selling 60% of Hydro One (a decision I have personally found it difficult to care much about, and I'm actually glad my taxes didn't need to go up in order to fund more transit infrastructure) than Mulroney was after he brought in the much-hated GST. Has Kathleen Wynne been perfect? Far from it, but her record is fairly solid including investments in public transit, in more accessible post-secondary education, and many other progressive policies. And choosing to invest in the economy rather than implement austerity budgeting does seem to have benefited the province which now boasts the highest economic growth in the country and record employment. If Doug Ford can claim Toronto's economic success as his own from his late brother's one circus of a term in office, why can't Kathleen Wynne claim the same? Yes, Wynne, while quite likeable, can also be quite ruthless. But is that a reason to hate her and toss her out? We don't throw out men for being ruthless if they're also quite likeable. Ontario voters are adverse to taking big economic risks. That's a historical political fact. In my mind, that definitely means one thing: the NDP will not be winning this election. So please, sorry, my Dipper friends, give it up. Furthermore, while the desire for a change of regime is real after 15 years of one party, I don't think voters will embrace change they're unsure about just for the sake of it. Especially as that change agent is Doug Ford, a man with simplistic slogans but clearly not much of a plan for pushing the province forward. Kathleen Wynne will campaign vigorously and effectively, articulating clearly her government's successes which are many and where she wants to take us forward. That "care" not "cuts" theme will slowly resonate and lift Liberal support up. Folks who supported her in the past will be surprised how convincing she is again this time. The hateful narrative of the last couple of years pushed constantly by her opponents and the media will be undermined. Of course, few pollsters will pick up on any of this. Doug Ford will do his best to keep it together. Thus far, he's sort of succeeded, but as scrutiny ramps up, his refusal to give little more than vague generalities when questioned for specifics, let alone articulate a coherent vision for the province, will slowly erode Tory support back into the mid-high 30s. If by some miracle, Ford over-performs and does stick to a clear message that resonates, his support currently in the low 40s will be maintained. But I'm not counting on it. On election night, most observers will be shocked how close the result will be between the PCs and the Liberals. The majority of pundits and pollsters who declared Wynne to be "dead woman walking" will have to eat serious crow. My current prediction: it could actually go either way between the PCs and the Liberals, with the NDP well back with 20 or so seats. I'll give the edge for now to a narrow PC minority win. We'll see how the campaign actually goes. And I'll be waiting to see what the next Nanos poll has to say. While the fundamentals are in place and won't change, it's also true that campaigns do matter. I don't vilify Doug Ford, nor do I only see bad things to come from him. I do oppose most of what he stands for and find his ignorance of the general public, policy and governance to be appalling. He's not a good fit for premier of Ontario. But after 15 years of Liberal rule, I do sympathize with those who want change. Ten years is usually the max one party stays in power in Canada. Had the PCs instead elected Christine Elliott as leader and not Doug, a huge PC majority would've been inevitable. One thing is for certain: this will be a fascinating election campaign and I look forward to seeing if my gut instincts are correct. Please return to this site as I'll try to post as often as I can on how the campaign is unfolding. The ON Libs have had their chance. They've failed and many have gone on to Ottawa to fail with the fed. Libs there. Like many, I've often held my nose and voted 'strategically for the Libs. It is time for Horwath. All decent ON Lib voters should vote NDP this time. End of story. Beware of Doug.